The home of the Large Hadron Collider (LHC), the world’s largest particle accelerator, is getting a new machine — and this time, the whole point is to keep it small. On September 18, the council that governs CERN, Europe’s premier particle-physics laboratory, near Geneva, Switzerland, approved a boost in funding for a planned experiment called the Advanced Wakefield Experiment, or AWAKE. Due to switch on next year, AWAKE will accelerate particles by ‘surfing’ them on waves of electric charge created in a plasma, or ionized gas. It is a method that could allow future accelerators to probe matter and the forces of nature at ever-higher energies, without the usual accompanying increase in the instruments’ size and therefore cost. Although plans are afoot to build bigger machines once the LHC reaches the end of its life in the 2030s, many fear that accelerator size is nearing its limit and that such proposals may simply prove too expensive to implement. “When you look at cost estimates for these machines and the scale of machines, you understand that maybe a new breakthrough regime is needed,” says Nick Walker, an accelerator physicist at DESY, Germany’s high-energy-physics laboratory in Hamburg. Conventional colliders, such as the 27-kilometer-long LHC, use electric fields to move charged particles through a tunnel; the fields switch from positive to negative at a frequency that means the particles are constantly nudged forward, gaining energy with each push. But such colliders use metal-walled cavities that spark if the electric field is too strong. As a result, the only way to further increase the particles’ speed, and therefore energy, is to lengthen the tunnel. Plasma wakefield accelerators, which were first proposed in the 1970s, are designed to break this cycle, says physicist Allen Caldwell at the Max Planck Institute for Physics in Munich, Germany, who will lead the AWAKE experiment. They send a pulse of charged particles or laser light through a plasma, which sets electrons and positively charged ions oscillating in its wake. The resulting regions of alternating negative and positive charge form waves that accelerate further charged particles. Injected at just the right time, these particles effectively surf the waves (see ‘Wakefield acceleration’). Crucially, as the electric fields are much stronger than those in a conventional collider, the acceleration can be as much as 1,000 times greater over the same distance. Such accelerators exist in prototype at several facilities around the world, but AWAKE will be the first time that CERN has experimented with the technology. “CERN is the world’s high-energy physics lab right now, and the fact that it has decided this is an important field to get involved in is a bit of validation for this community,” says Mark Hogan, an accelerator physicist at the SLAC National Accelerator Laboratory in Menlo Park, California. Different groups have different ways of setting the plasma oscillating: Hogan’s team at SLAC uses pulses of electrons, for example. AWAKE will be the first to use pulses of protons, which have some big advantages. Because protons have greater mass than electrons, each proton pulse penetrates further into the plasma, setting up a longer series of charged regions, which in turn provides greater acceleration per pulse. A proton machine is also compatible with the LHC, which accelerates and collides protons. For now, AWAKE will use the proton bunches that feed the LHC to test whether protons can generate the electric fields necessary to accelerate particles in plasma. The latest investment from CERN — worth 2.6 million Swiss francs ($2.7 million), from the total of 21.4 million Swiss francs so far committed to the experiment — is intended to allow AWAKE to test the concept before the end of 2018, when CERN is scheduled to shut down its accelerators for an upgrade. 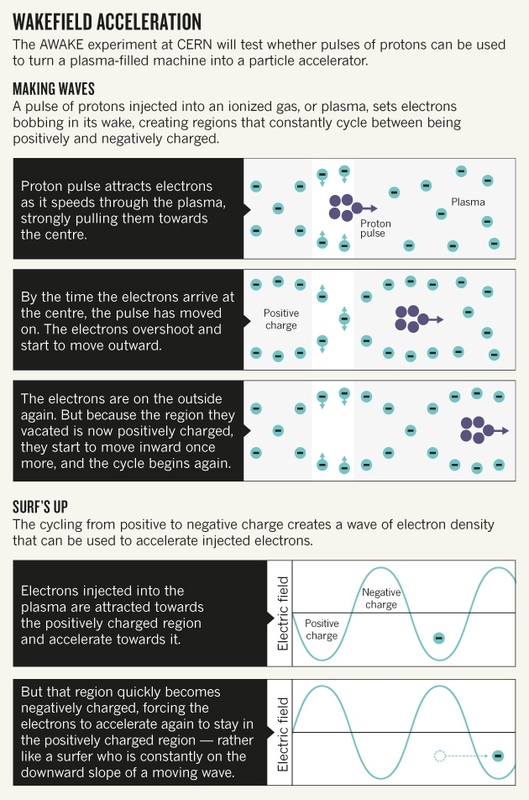 Success will depend on whether these proton bunches, which are long relative to what is needed to create plasma waves, can be efficiently chopped up into short pulses. Eventually, it might be possible to inject the much-higher-energy protons that have been accelerated by the LHC into a plasma wakefield machine for further acceleration. Hogan estimates that a machine just a few kilometers long could produce electrons with 6 times the energy of those that would be produced by the next planned conventional accelerator, the 31-kilometer-long Inter-national Linear Collider. Despite such promise, plasma accelerators are decades from practical use because, to do better than existing accelerators, they must also match them in efficiency — supplying focused, accelerated particles at high rates as well as high energies, says Walker. Still, he adds, “right now, this is the only thing I see that might work”. This article is reproduced with permission and was first published on October 7, 2015.